The Ohio Department of Commerce has announced that Ohio’s minimum wage is to increase on January 1 2018. It will increase to $8.30 per hour for non-tipped employees and $4.15 per hour for tipped employees. The minimum wage will apply to employees of businesses with annual gross receipts of more than $305,000 per year. 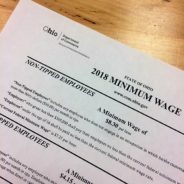 The current 2017 Ohio minimum wage is $8.15 per hour for non-tipped employees and $4.08 for tipped employees. The 2017 Ohio minimum wage applies to employees of businesses with annual gross receipts of more than $299,000 per year. The Constitutional Amendment [II-34a] passed by Ohio voters in November 2006 states that Ohio’s minimum wage shall increase on January 1 of each year by the rate of inflation. The state minimum wage is tied to the Consumer Price Index [CPI-W] for urban wage earners and clerical workers for the 12-month period prior to September. This CPI-W index increased by 1.9 percent over the twelve-month period from September 1 2016 to August 31 2017. You can access the Constitutional Amendment online. Employers should remember to post the Ohio Minimum Wage 2018 in their place of business. Additionally, we remind employers to stay up to date on the required postings for their state. Click here to access the list of required postings in the State of Ohio. If you have questions about required postings or other compliance issues, contact us and check out our blog for more helpful resources.